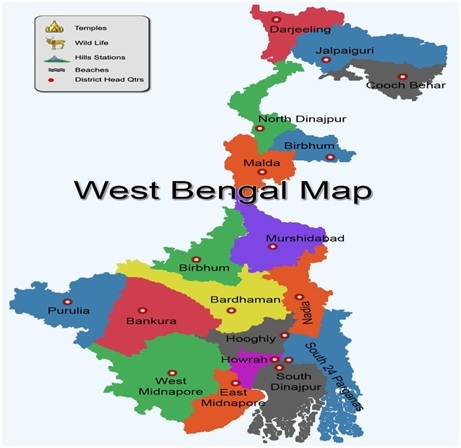 West Bengal is a state in eastern India and is the nation's fourth-most populous state, with over 91 million inhabitants. Spread over 34,267 sq mi (88,750 km2), it is bordered by the countries of Bangladesh, Nepal and Bhutan, and the Indian states of Odisha, Jharkhand, Bihar, Sikkim, and Assam. The state capital is Kolkata. This state is most famous for Royal Bengal Tiger in Sundarvan. West Bengal is a state in eastern India and is the nation's fourth-most populous state, with over 91 million inhabitants. Spread over 34,267 sq. miles (88,750 km2), it is bordered by the countries of Bangladesh, Nepal and Bhutan, and the Indian states of Odisha, Jharkhand, Bihar, Sikkim, and Assam. The state capital is Kolkata. This state is most famous for Royal Bengal Tiger in Sundarvan. Service industries contributes 58% of state GDP while Agriculture just 18%. Read more:Importance of West Bengal in India , data on the economy of West Bengal , dances of West Bengal , festivals of West Bengal , facts about West Bengal , Most interesting facts about West Bengal , Gk , General Knowledge , Gk on West Bengal , West Bengal Tourism , West Bengal capital , West Bengal population , important facts about West Bengal , facts about West Bengal , information about West Bengal state , West Bengal information for kids , 10 facts about West Bengal , few lines on West Bengal.